WHAT ARE THE MAIN SOURCES OF GROWTH TODAY? Digitalization, Global expansion and targeted Acquisitions are powerful drivers of business value today. 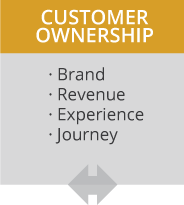 Fast Growth opportunities are available in almost any industry for those companies that TRULY OWN THEIR CUSTOMERS and show real DIGITAL LEADERSHIP. They will be able to reinforce their core strengths with appropriate digital accelerators. Digital Leadership, Global Expansion and focused Acquisitions are imperatives for any business executing a FAST GROWTH strategy. HOW DO WE APPROACH THE DIGITAL OPPORTUNITIES EFFECTIVELY? This is the question that all organizations are struggling with: there is the understanding that Digital can generate new opportunities, but there is also the challenge associated with possible disruption, risks associated with implementation, and judgment mistakes about how technology can add value. Any business function today is impacted by technology and in particular the availability of information directly to help decision making and the faster and more pinpointed execution of activities. Digital Transformation is the highly customer specific process of adopting appropriate technologies and digital business practices within the context of a traditional business, where the digital and physical components work together to deliver on a strategic intent. It involves building digital capabilities and deploying them to achieve superior business results. No two organizations are in the same situation and so there is no shortcut approach to Digital transformation just executing a template. The challenge is proper activation, phasing and rightsizing of initiatives to deliver on the vision. WHAT IS THE IMPACT OF DIGITAL TECHNOLOGY AND BUSINESS PRACTICES? Digital is no longer just tactical, as past technology adoption cycles have been. It is now clearly strategic in nature and there is a need for the leadership to acquire new skills that address these strategic impacts of digital effectively. The Digital business dynamics have a profound impact on any business beyond just the immediate specific projects, it’s accelerating the rate of change and the complexity of the business. Focused Growth Partners helps organizations with these critical skills in the short term while building capabilities into client organizations to help these businesses execute future cycles on their own. While working with a broad diversity of organizations on their Digital Transformation Journey, we discovered the key elements that are common to all companies even though each project is highly optimized for that specific organization. 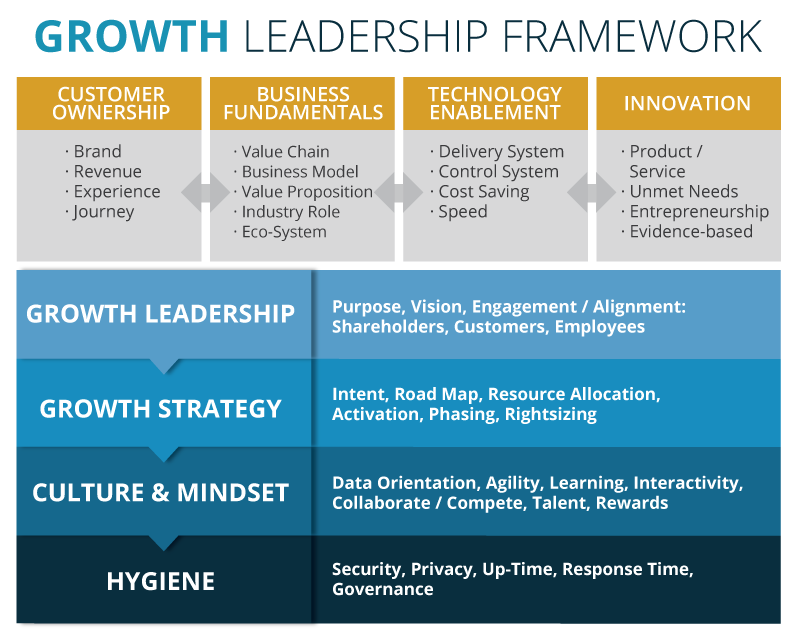 From this experience, Focused Growth Partners, Inc. developed a proprietary digital leadership framework. The Focused Growth Partners audit, diagnostic and Re-Visioning toolset are based on this model. The Leadership Framework has FOUR IMPACT AREAS where benefits manifest themselves and FOUR GROWTH LEADERSHIP AREAS where conditions are created for the impact areas to deliver the results. 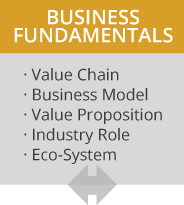 Opportunities to collaborate in the value chain, determining what relationships will drive eco-system growth and will strategically reinforce the core value proposition of the organization. Transparent, plug and play components delivered from cloud and mobile platforms, removes huge technology and investment barriers to enable faster and more efficient business processes utilizing agility aspects to implement changes and improvements. 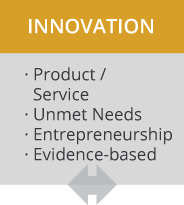 Evidence-Based Innovation™, lean business principles that enable quick innovation without huge investments at a time when ideas are not yet proven. Separation of behaviors that allow for appropriate talent deployment and development. The benefits manifested through the four Impact Areas can be huge. Many organizations will want to show progress in one or more of these areas quickly. While that is possible and beneficial, the fundamental, longer term success and profitability of a Digital Transformation or Growth Strategy is enabled by the fundamental leadership elements of these Growth Leadership Areas. The speed and agility of a business is a key to ensuring an organization can effectively adjust to rapidly changing market and technological conditions. In the New Economy there will increasingly be “pure play” – “born digital” companies who challenge the existing traditional or “born physical” companies. This changes the nature of the competitive playing field. The most successful companies will have digital AND physical components working together in a cohesive and synergistic strategy. Increased speed of change in business environment. Interactivity with customers and other players in each industry is increasing. Rapidly emerging new technologies give rise to sudden new opportunities and risks which drives a need for a more responsive, agile organization. 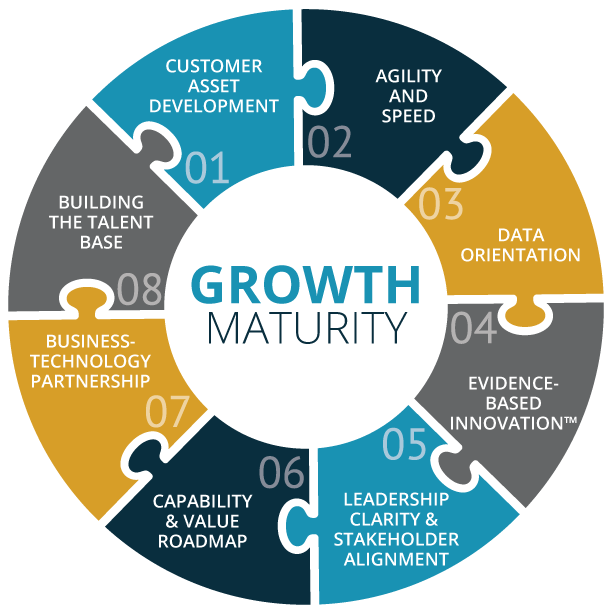 In today’s environment, leadership and customer connection are absolute requirements, however, there are EIGHT FACTORS that determine maturity and readiness for Digital Growth strategies to be successful. Knowing and understanding the customers deeply, building relationships and insights that will drive mutually beneficial value creation. There are certain techniques that can be deployed to bring customer relationships to a more strategic level. Digitalization accelerates all aspects of the business and can create unexpected opportunities. To derive the benefits from this new operating environment the company must develop processes that build agility. 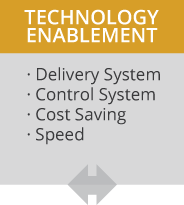 Technology allows us to acquire data about all business aspects quickly, efficiently and relatively inexpensively. The skills to acquire, analyze and action this data is essential. Those skills allow the financial goals and benefits to be derived from the huge volume of data. A discipline and methodology to validate innovations early and often utilizing mathematical tools. This approach to digital innovation has been developed by our partners based on years of highly successful experience in a variety of businesses and industries. Leading the company with a clearly articulated perspective of purpose, vision and strategy. Ensuring alignment of stakeholders and energizing all contributors to achieve goals. Digital businesses have to operate at high speed and this is only possible if employees are clear on how they can contribute and have been properly aligned, engaged and energized to do so. Creating a dynamic road map for the company and its innovations is crucial to provide clarity, direction and accountability to all stakeholders. Digital strategy development is a dynamic process where technological components have the potential to deliver sustainable competitive advantages. Business leaders and Technologists must work together as partners to create and recreate these strategies. Digital business requires new business skills for which new employees must be hired and trained. Talent engagement is crucial to support the acceleration, interactivity and problem solving capability of the agile organization.